I read that phrase years ago and cannot get it out of my mind. We are obsessed with bigger and faster and more—but for what purpose? NBC News presidential historian, Michael Beschloss, spoke in March at the national meeting of the American Council on Education about the increased pressure on the president to respond quickly to national issues due to the social media phenomenon. 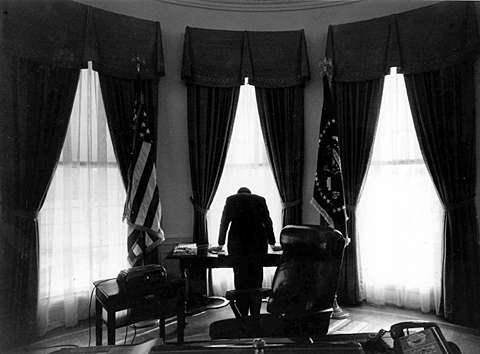 As a stark example, he referred to the 1962 Cuban missile crisis and said that if President Kennedy had been forced to respond in the same timeframe that current presidents are expected to respond, he would have chosen to unleash heavy military action. It is estimated that forty million lives would have been lost. Forty million. Thankfully, there was time to reflect, and a different decision. Charleston has dominated the news of late and rightfully so. It is an unspeakable tragedy—although there has been a lot of speaking anyway. I get it. Today, you have to speak quickly on important issues or you will miss the chance when the next story arrives. I, too, have very strong feelings about the recognition of persistent racism in America and access to guns and gun control and the Confederate battle flag and am “committed to the quest for continually improved means” such as these (and more), but I would like some time and space for a deep and difficult examination of the true “ends” so that we might have shockingly productive conversations on how to get there. My premise today is simple. For things to look up—and things can always look up—we need deep, measured, thoughtful conversations until we agree on where we are going, but it has grown more difficult to have such conversations because of our obsession with immediate actions. * Click HERE if you are interested in an essay published in Pepperdine’s Dispute Resolution Law Journal a couple of years ago where I reflected on the fiftieth anniversary of Dr. King’s “I Have a Dream” speech. It concludes with an attempt to identify Dr. King’s “end” given his language.